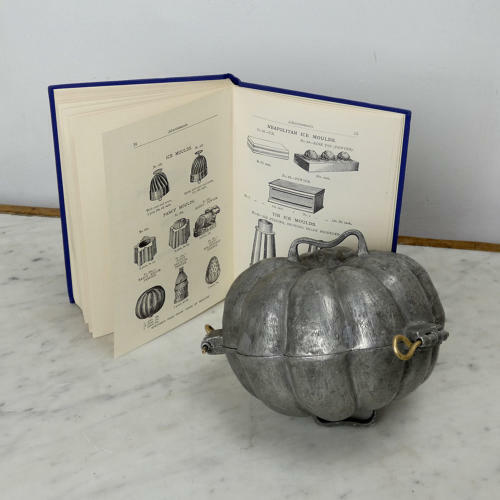 An interesting, large, pewter, two part, ice cream mould in the shape of a gourd. This mould has no manufacturers marks and it dates from c.1870. The mould has three hinges which are held together by brass pins and to either side there is a pewter handle in the casting which would help to make it easier to use. The measurements are the total dimensions, which include the hinges and handles. The gourd, although fairly simple in form, is well detailed and very naturalistic. This would be a super mould to use for moulding pumpkin ice cream! It is in excellent condition. The exterior has quite a dark patina and the interior is in excellent, bright, usable condition.